This is the second of the pair of blue Volant notebooks, in a lighter blue. This one I drew with a more abstract design in just two colors of oil paint marker, blue and black. I wanted to explore the idea of clusters of objects, and interconnectedness, without getting too obsessive about the details. The first clusters I drew at the top were close-fitting and made me think of blackberries, so as I moved downward I tried to add a little more space and looseness to their structure. 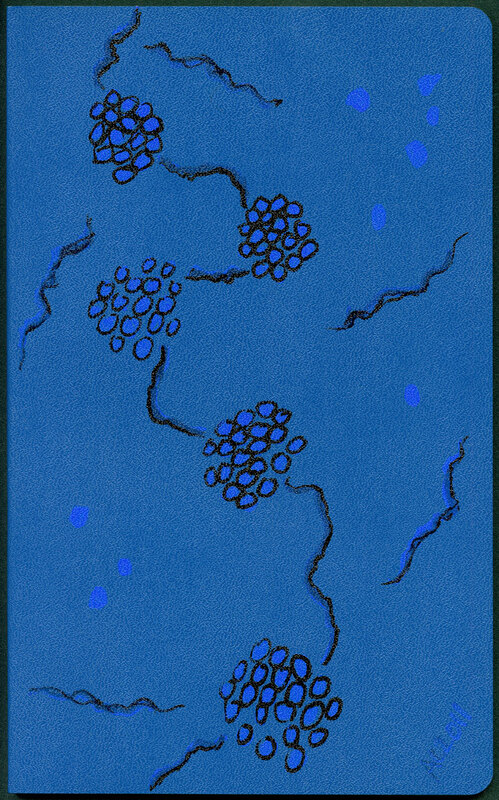 Clusters, 5″x8.25″ Sharpie oil markers on a 96-page blank Moleskine Volant. $29 with free shipping.